Kyon is pleasant and clueless. Yuki is aggravatingly/annoyingly cute and helpless. Haruhi is, as usual, a jerk ... but not in a fun way. Tsuraya and Mikuru are along for the ride. Well at least there is one constant from the original. I was originally ecstatic about this series ... until I watched it. Except for the five episodes having to do with the aforesaid "disappearance", the other eleven episodes were a total waste of time. Nothing more than a typical high school romance anime complete with the mandatory (Japanese law requires such.) hot springs and beach episodes. Yuki's in love with Kyon but is too shy/chicken to show it. Kyon is oblivious to her affections. Ryoko tries to get them together. Itsuke tries to get himself and Kyon together. Haruhi, Tsuraya and Mikuru are just there because they were in the original series and movie. After nine "filler" episodes Yuki has a near accident and is mentally replaced (Hence the titles' "disappearance".) by "another" Yuki unlike herself who actually confesses to Kyon. 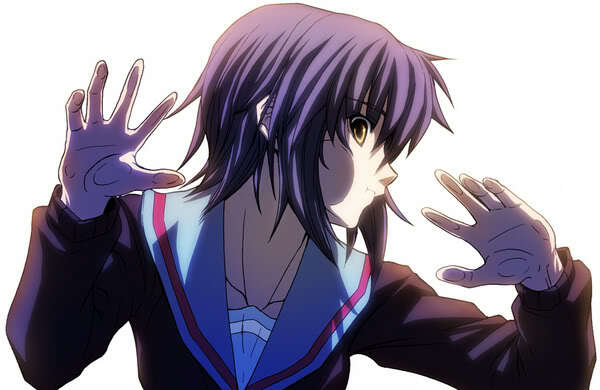 Yuki later "comes back" to herself and reverts to the klutzy little mouse from the beginning. Even though Kyon confesses to the "other" Yuki later, everything (Though she resolves to eventually express her feelings toward Kyon.) ends up with Yuki the same as before like the series never happened. No real conclusion, no real ending. Might as well as not have watched it. Wikipedia article on the series here. Go to Jay' Tee Vee blog main page here. You're already there if ya' sees articles under this 'un. School Days: A Real Time Saver!